Papua New Guinea Prime Minister Peter O’Neill , has welcomed the commitment by the Green Climate Fund (GCF) to provide finance for addressing the effects of climate change in Papua New Guinea. In a meeting this week with the GCF Chairman, Mr Ewen McDonald, the Prime Minister highlighted the need for finance and capacity building to enable Papua New Guinea to implement its obligations under the Paris Climate Change Agreement. “Our nation and the region faces serious threats from extreme weather exacerbated by climate change,” the Prime Minister said. “Developing countries did not cause climate change, but we all suffer because of climate change. “It is important that industrialised countries contribute to projects that will help to protect our communities from the affects of climate change. “The Green Climate Fund provides important opportunities to implement climate change projects that will help our communities. 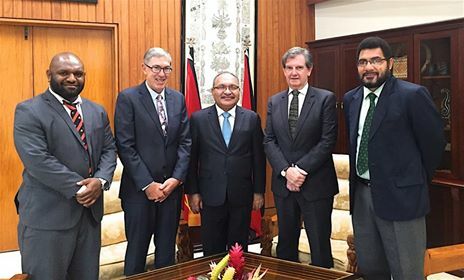 The Prime Minister said an important focus for current GCF engagement is to work with Pacific countries to develop project proposals before submitting to the GCF Board for deliberation. “The process of identifying and developing projects is driven by individual countries and ensures that projects are developed that are specific to the dangers faced by our people. “Papua New Guineans know what we need in our communities to deal with damage brought about by extreme weather. Mr O’Neill thanked the Green Climate Fund and the Australian Government for their continued support on dealing with the consequences of climate change as a shared concern. GCF officials have already conducted a number of workshops for participants from government entities, businesses, NGO’s, foreign donor agencies and other interested individuals.